When he saw the woman lying there with her eyes open, he felt a catch in his throat. Her black hair was brushed out over the stained pillowcase. There was a flush of unfamiliar color in her cheeks. I loved the Witching Hour! Sounds like a great book, I'll have to keep my eyes open for it. Thanks for stopping by my blog. I loved The Witching Hour and hated the rest of the series. I hope you enjoy it. Here's my cinnamon roll teaser! Ooooo sounds goood. I use to love Anne Rice. Great teaser and thank you so much for visiting my blog. PS Are you on Goodreads? I always say that thriller or horror books produce the best teasers! Thanks for visiting my blog! @Juju At Tales of Whimsy.Com: I love her :) Yes, I am on Goodreads! I love Anne Rice but I haven't read this book! Great teaser and thank you for stopping by my blog! This is probably my favorite of all Anne Rice's novels, and I pull it off the shelf and re-read it every two or three years. I'm sure you will love it - but hang on tight, you're in for quite a ride!! Great teaser! 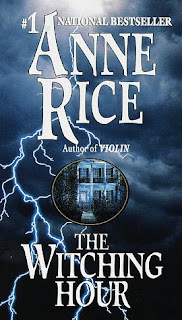 I love Anne Rice and this is great book. Oh Priya! This is one of my most favorite Anne Rice books. I had chills forever reading this one and I had to sleep with the LIGHTS ON! Wait till you read the next ones in this series... oh I think I'll take my copy out and re-read this one! good one.. thanks for coming down to my space.. love the tuesday rewind thing as well. will try to participate sometime in future.. Thanks! :) Top Ten Tuesday seems real fun, you should definitely participate!! BTW I'm your newest follower. Let me know if you have a goodreads account as well!